It's thick. Luxurious. Concealing. The cloak of death will make you feared, envied, and maybe even wealthy. It will also smother your soul. The best assassins in the Sixth World can gain untold wealth and even make the whole world shake, but they will also be hunted and stalked until the end of their days. Assuming their conscience doesn't eat them alive. 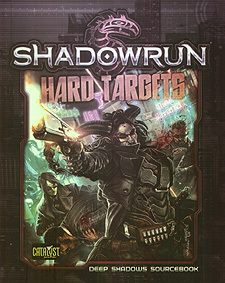 Hard Targets is a shadowrunner's guide to bringing death, with informations on getting into wetwork, tactics for doing the job, and critical gear. It also contains plot details and adventure hooks, including an in-depth look at the city of Havana in the Caribbean League, a political and criminal hotspot that lends itself to all sorts of wetwork jobs. The work is there - if you can deaden your soul enough to take it.